You do a smashing job with your journals, Rebecca!! Love this one and the colors are grand! I'm just curious if you stitched the actual journal yourself as well? Happy Sunday and thanks for sharing, I'm a big fan of your work!! This is beautiful Rebecca! LOVE the gorgeous colors!! Thanks for sharing and hope you are having a GREAT weekend! I love those colors and that fabric button is great!! So pretty and just love the folded flower with the button! This turned out amazing! I love the flower you made behind the button. It is really cute! Oh Rebecca, do not sell yourself short my dear....this Journal is Jaw Dropping. I really swooned out loud when I first got to peek at it...amazing color choices with all your supplies and I adore the layout. Love the rosette with the button center...DARLING! What perfect colors for this beautiful button from PP! 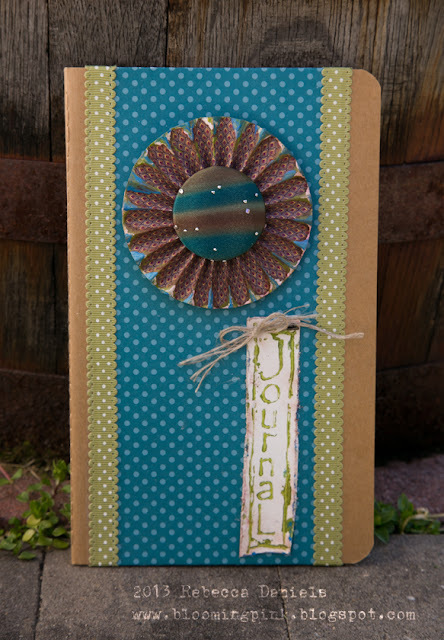 Lovely journal! Great notebook. Love how you used that button.